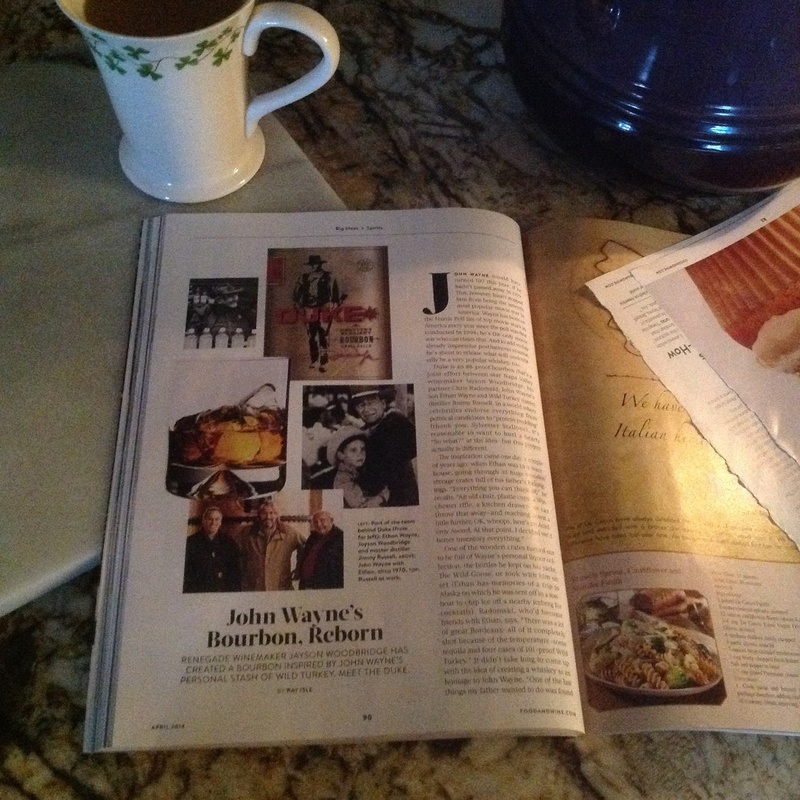 Standing in my dark kitchen this morning, nothing but the soft glow of the oven light and hum of the ice maker, plundering my latest issue of Food & Wine (I’ve become a recipe ripper instead of a magazine saver), John Wayne jumped up from page 90 and my Hero bent my head to the small type. God forbid we turn on the overhead lights for this. Turns out there is a new bourbon in town appropriately called “Duke”, inspired by Wayne and brought to life by maverick vintners and a master distiller. Pick up the April 2014 issue for the full article. This stuck me as serendipitous. From his inception, Himself (WIP hero), has been a vintner and fan of both The Duke and bourbon whiskey. His dulcet tones demanded we have some in edits. Including a bottle of the “limited-production, super-high-end…Duke Special Reserve Brandy”, released in the Spring of 2013. God bless him for not demanding a rewrite before the first draft is complete. For me, part of the fun in writing and reading fiction is blending the story with real people, places and things. Sometimes outrageously so. At one point in his formation, Himself was friends with both Gen. David Petraeus and PM Tony Blair. This merging of worlds is a Catch 22 for me. Saves in world building, ah la Tolkien, Martin & Rowling. But the necessity for truth as it relates to locations and timelines of events is more restricting. I can’t very well move 9/11 to 2007 in order to make my characters 10-15 years younger. As I plod on through the first draft, another sticky note is added for edits. I know SA and CC have their own stickies too as real life throws story fodder at our feet. What real world characteristics do you find most interesting in fiction? Does it make the read more entertaining to discover something in common with the characters? That “hey, me too” moment. What book or author does that best? That article was definitely a sign! (Also a sign we should, perhaps, be revising the list of refreshments for the next retreat – in the name of research, of course). Leave a reply on "Wayne, Whiskey, Writing"